Seasons turn on games like this. Chasing the same targets as Leicester, Middlesbrough have a similar history to the Foxes and games between these sides have always been tight-knit affairs. This fixture was no different and turned on two crucial points that could define City's season. David Nugent's well-taken goal was all that separated the sides going into stoppage time, when Jamie Vardy left his leg dangling to upend Rhys Williams to give away a penalty. Kasper Schmeichel's full-stretch save denied Marvin Emnes to earn Leicester all three points, an overnight slot in second place and a six-point cushion over sixth-placed Watford. The win takes the headlines, but... Far from this being a forgettable winter encounter, for the 8,585 fans who valiantly battled the elements to attend the game it will be one they surely won't forget. The game went ahead despite suffocating congestion across Leicester thanks to snow, with the Boro team coach stuck in traffic on Narborough Road and many players abandoning their cars to jog to the King Power Stadium. This was football at it's most raw. Recently the headlines have been hogged by new front man Chris Wood, but it was Nugent who commanded the Foxes' front line against Boro. Twice he saw the ball strike the back of the net only to be ruled offside and it seemed once again that this was not to be Nugent's day. A good through ball from Wes Morgan was flicked neatly on by Wood who turned provider as Nugent rifled home from within the penalty area to earn the plaudits as man of the match. His flourishing partnership with Wood is seeing both players keep the likes of Vardy, Martyn Waghorn and Marko Futacs out of the first team and, whilst both are on scoring form, the future is bleak for those other front men. A legend in the making. Most supporters are in agreement that Schmeichel is the best goalkeeper Leicester City have possessed in a long, long time but his penalty saving record surely surpasses even the greatest of the great keepers to have stood between the Filbert Street goal posts. Emnes' spot-kick here will not rank amongst his best but the Great Dane was at full stretch to deny the Boro striker. 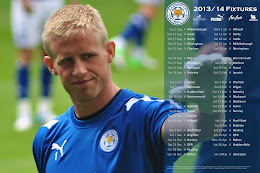 Schmeichel has now amassed a league best twelve clean sheets and is deservedly earning praise for his leadership and dedication to the cause. His presence in defence is almost enough to carry the Foxes' back line and once again Morgan was the rock, crucial to earning his team another clean sheet. A year on from Ben Marshall's sudden burst onto the scene, he seems a different player to twelve months ago. Then, Leicester fans were reveling in the former Stoke City man's energy and ability. His long passing and free-kick taking were compared to those of David Beckham in his prime. No longer: Marshall has lost some of his energy, his touch and his raw skill which made him the player he was. He is still young and, like Andy King before him, he is entitled to a bad season but without him Leicester lack a little edge in attack. The alternative choice, of Lloyd Dyer, is a pacey one but what Dyer lacks is the passing and finishing cutting-edge of Marshall in his prime. Neither full back offered the attacking threat Foxes' supporters will be used to and both were lacking in the fizz and energy of the City midfield. Perhaps Tony Mowbray's strategy, to utilise the width of the King Power Stadium pitch, paid off for the away side but whatever the reason, Leicester had to find other avenues to enable their attacking play. Gaming has truly become a hobby for anyone with interests that run the full gamut. Online Games are a great way to just have some fun and relax once in awhile. The following paragraphs have some really good ideas regarding video games, so pay attention! Auctions on the Internet are a great place to buy games from. You can save a lot on computer games by purchasing them on auction sites. Conduct some searches to fund the best possible deals. After that, just keep on bidding. Sit down and play some online gaming together with your children. This helps you learn much more about your kid's interests. You will find many amazing conversations happen while gaming. You can also watch and help their developmental skills grow. Hang onto those old computer games you used to play. Trade in your games for new ones or for cash to maximize your investment. You can use store credits from your old games to go towards the purchase of new ones. Ask for suggestions from the game store employees about games you will like. A lot of people like different kinds of video games, you should look to branch out. You will find that the clerks can offer a variety of recommendations that you can enjoy for many happy gaming hours. If you are thinking about purchasing a video game for a child, you may want to look into what each ESRB rating means. These ratings help you learn what games are best for your kid's age level so that you can avoid inappropriate content. The ratings tell you which games are appropriate. Many modern online games give you two choices. First, you can earn in-game content and rewards gradually through investment of your time and work. Or, you can just flat out buy them with your real world money. Consider how much advantage these purchases will actually give you in game. Many cash purchases don't really do that much to help you win the game. Or, they might improve it a lot and save you tons of time. You can get good deals by purchasing used computer games. It is a good idea to buy a disc cleaner if you buy a lot of used games, though. You never know what sort of shape your game will be in when you do this. If your discs are really dirty a good cleaning kit will help to restore them. It is a good idea to look at several cleaning disc options. There are many kits like this on the market.